'다목적 근거지'는 문래 예술공장 MAP프로젝트를 위해 제안한 것으로 파트타임스위트가 각 분야에서 활동하는 젊은 작가 혹은 그룹을 초대하여 그 안에서 어떤 일들이 가능할지를 모색하고자 한 협업 프로젝트이다. 파트타임스위트는 총 10명의 협업자들이 함께 모일 수 있는 공간을 물색하다가 문래 예술공장 지하 주차장 한쪽에 자리 잡은 다목적실을 프로젝트 진행을 위한 공간으로 삼게 되었고, 그곳을 '다목적 근거지'로 명명하면서 전체 프로젝트의 타이틀이 되었다. 모든 멤버들은 다목적 근거지에서 지난 10월부터 비/정기적으로 모임을 가졌고, 각자의 작업을 위해서도 자유롭게 공간을 활용하였다. '다목적 근거지'는 애초에 협업을 통해 어떤 결과물을 만들어내는 것이 목표가 아니었으며 오히려 협업에 동의한 멤버들이 스스로 공동의 내용을 만들기를(만들어지기를) 기대하면서 가능한 협업의 형태를 발견해보고자 한 것이었다. 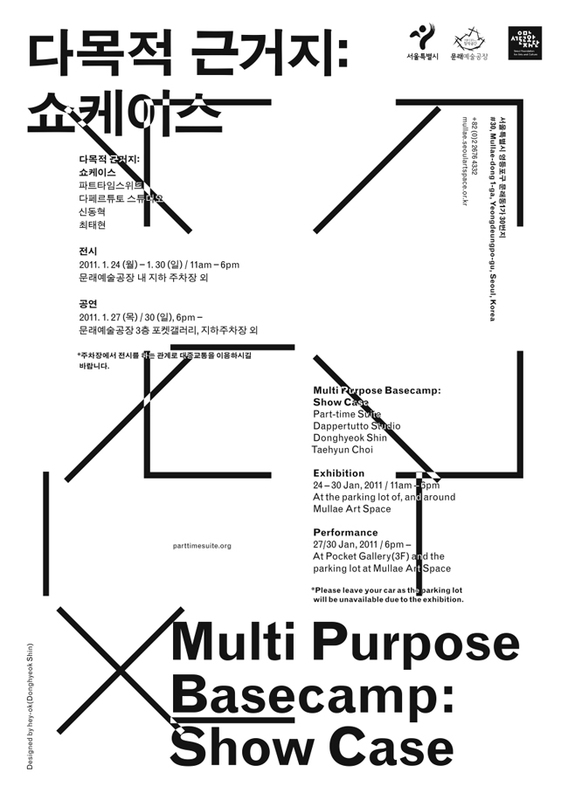 Part-time Suite proposed the collaboration project Multi Purpose Basecamp for Mullae Art Space's MAP Project. We brought young artists working in various fields solo or as a group together to see what would become possible within the chemistry. When we needed a place for ten of us to gather, we decided to occupy a multipurpose room in the corner of the underground parking lot in Mullae Art Space, and called it "Multi Purpose Basecamp," which eventually became the name of the entire project. From last October, all ten members have been meeting at the basecamp on a regular basis. Sometimes there were some additional casual encounters, with each participating party using the room freely for its separate projects. Multi Purpose Basecamp wasn't aimed at completing a planned work through a coordinated effort, to begin with. We tried to discover a possible form of collaboration and, with the members having agreed to work together, hoped a kind of shared content would emerge or be created spontaneously. [다목적 근거지: 발간물]은 쇼케이스가 끝난 후 프로젝트와 관련해 각 멤버들이 교환한 총48개의 질문과 그에 대한 답변을 중심으로 엮어졌다. 그 동안의 어려웠던 협업과정과 서로에게 하지 못했던 말들, 기대와 아쉬움의 표현, 작업에 대한 태도들이 여러 가지 대화들과 이미지를 통해 드러난다. Multi Purpose Basecamp: the Publication mainly consists of the 48 questions involving the project and the members’ answer to them. The questions were exchanged by the collaboration members after the Showcase. A variety of talks and images reveal the difficulty of the collaboration process, words the members hadn’t been able say to each other, expectations and disappointments and different approaches on work.